This week's issue of the Roslyn News features a full-page back cover article by Joe Scotchie highlighting the return of the Black Beast to the Indy 500. 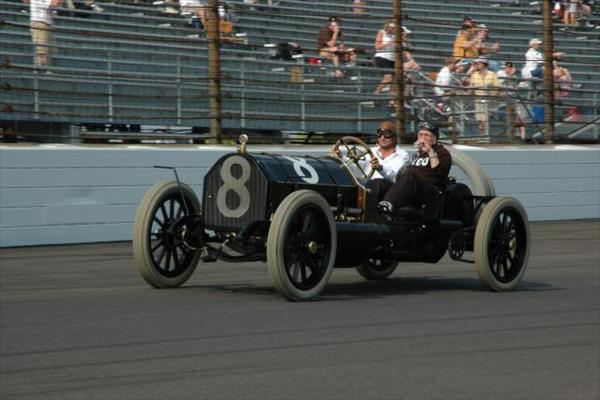 On Sunday, May 29, the Black Beast and four other race cars from the 1911 Indy Race took a parade lap before the historic 100th Anniversary Indy 500 Race. The car was also featured in a four-page article in the 2011 Official Indy 500 Program. Driving the car was legendary racing champion Emerson Fittipaldi, a two-time Indy 500 winner. Fittipaldi reached 68 miles per hour in the car, which, according to Kroplick, was the same exact speed achieved by the racer 100 years ago by its original driver, Harry Grant. After the run around the track, Kroplick and Fittipaldi were given another big thrill. They were greeted by Mario Andretti, another winner at Indianapolis and one of the legendary race car drivers in American history. The triumphant return to Indianapolis was a big thrill fro Kroplick and his wife, Roz, and it represented a perfect homecoming for this legendary race car.